Artichoke is one of the favorite winter season edible flower buds. Known as "Ankinara" in Greek, its use as a vegetable is well known to the ancient Greeks and Romans who advocated it for its medicinal and health benefiting qualities. Botanically, it belongs to the thistle family (Asteraceae), in the genus: Cynara. Scientific name: Cynara cardunculus var. scolymus. Globe artichoke grows up to 1.5-2 m tall, with arching, deeply lobed, silvery-green leaves about 0.5 m long. If left alone, beautiful light pink, or purple flowers develop forming a large head from the edible buds. The bud is composed of compactly arranged triangular scales in a whorl-fashion around a central "choke." (Photo courtesy: norwichnuts) Artichoke bud. Globe artichoke grows up to 1.5-2 m tall, with about 0.5 m long, arching, deeply lobed, silvery-green leaves. Its flower bud, known as the "globe," composes tightly packed triangular scales arranged in a whorl pattern around the central "choke." If left alone, a beautiful light pink to purple flower appears out of this globe (flower bud). Each artichoke globe measures about 6-10 cm in diameter and weighs about 150 g. Fuzzy, immature florets at the center of the bud constitute its "choke." These are inedible in older, and larger flowers. The edible portion of the buds consists primarily of fleshy lower portions of the involucre bracts (triangular scales) and the base, known as the "heart." Cardoons (Cynara cardunculus) are intimately related species to artichokes. However, unlike in artichokes where their flower buds were sought after part of the plant, the blanched leafy stalks are the edible portions in cardoons. Several cultivars of artichoke grown and categorized based on their size, color, and spine. Globe artichoke is low in calories and fat; 100 g of this flower bud just carries 47 calories. Nonetheless, it is one of the finest sources of dietary fiber and antioxidants. It provides 5.4 g per 100 g, about 14% of RDA fiber. Dietary-fiber helps control constipation conditions, decreases bad or "LDL" cholesterol levels by binding to it in the intestines and help cut down colon cancer risks by preventing toxic compounds in the food from absorption. Artichoke contains bitter principles, cynarin, and sesquiterpene-lactones. Scientific studies show that these compounds, not only inhibit cholesterol synthesis but also increase its excretion in the bile, and thus, help overall reduction in the total cholesterol levels in the blood. Fresh artichoke is an excellent source of vitamin, folic acid; provides about 68 µg per 100 g (17% of recommended daily allowance). Folic acid acts as a co-factor for enzymes involved in the synthesis of DNA. Scientific studies have proven that adequate levels of folates in the diet during the pre-conception period, and during early pregnancy may help prevent neural tube defects in the newborn baby. Fresh globes also contain moderate amounts of the antioxidant vitamin; vitamin-C (Provides about 20% of recommended levels per 100 g). Regular consumption of foods rich in vitamin-C helps the human body develop resistance against infectious agents and scavenge harmful, pro-inflammatory free radicals from the body. It is one of the good vegetable sources for vitamin-K; provide about 12% of DRI. Vitamin-K plays a vital role in bone health through promoting osteotropic (bone formation) activity. Adequate vitamin-K levels in the diet help limiting neuronal damage in the brain.It thus has a valuable role in the treatment of patients who have Alzheimer's disease. It is an also a good source of antioxidant compounds such as silymarin, caffeic acid, and ferulic acid, which help the body protect from harmful free-radical agents. Total measurable antioxidant strength (ORAC) of artichokes (globe or french) is 6552 µmol TE/100 g.
It is also rich in the B-complex group of vitamins such as niacin, vitamin B-6 (pyridoxine), thiamin, and pantothenic acid that are essential for optimum cellular metabolic functions. Further, the artichoke is a rich source of minerals like copper, calcium, potassium, iron, manganese and phosphorus. Potassium is an important component of cell and body fluids that helps controlling heart rate and blood pressure by countering effects of sodium. Manganese used by the human body as a co-factor for the antioxidant enzyme, superoxide dismutase. Copper required in the production of red blood cells. Iron helps in the red blood cell synthesis in the bone marrow. Additionally, it contains small amounts of antioxidant flavonoid compounds like carotene-beta, lutein, and zeaxanthin. Harvest when their buds are still immature and pick just before their petals begin to open. Fresh globes can be readily available in the market all around the season, although they are at their best during the spring. 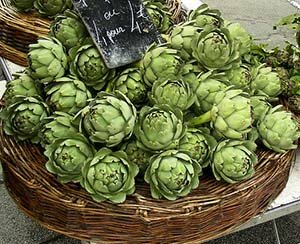 In the store, choose fresh artichokes that feel heavy for their size and without any cuts or bruise. Its leaves should be compact (appose tightly together), should feature dark green and squeak when squeezed. Avoid large, overmature globes as they are unappetizing. The globes best used while they are fresh. However, they can keep well if stored in the refrigerator in a sealed plastic bag for up to a week. Artichokes are a popular winter season vegetables across Europe. Small or baby artichokes can be eaten completely without removing spiny choke lying inside. To prepare bigger globes, rinse them under cold running water. Trim away the stem, leaving about 1 inch from the base. Remove the lower layers of scales as they do not contain any flesh. Using a pair of scissors, trim away thorny scale ends. Trim its top end using a paring knife up to an inch. Spread out the scales with fingertips and then scrape off its central choke. Rub a lemon slice over a cut portion to prevent it from turning brown (discoloration). Then, the globe is boiled in the water upside down with some added salt and lemon juice until it gets soft. To eat artichokes, take off one leaf at a time, dip in your favorite sauce, and scrape off the fleshy base with your teeth. Center and base portions of the scale, close to its attachment to the heart, in fact, holds a lot of edible flesh. Be sure to provide a side plate to pile discarded leaves, and a soft towel/finger bowl to wash hands for the guests! 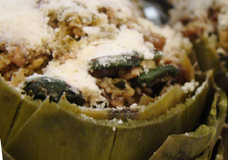 Artichokes can be enjoyed mixed with vegetables, beans, meat, or stuffed with seafood. The globes, in general, are cooked by deep-frying, sauteed in oil or barbecued. The "heart" is the favorite part of artichoke appreciators!. Its stem, which often discarded unwantedly, can also be enjoyed. The stem is delicious and tastes like that of hearts. Allergic reactions to artichoke are uncommon. (Medical disclaimer). <<-Back to Vegetables from Artichoke. Visit here for an impressive list of vegetables with complete illustrations of their nutrition facts and health benefits. Inhibition of Cholesterol Biosynthesis in Primary Cultured Rat Hepatocytes by Artichoke: aspetjournals.org.